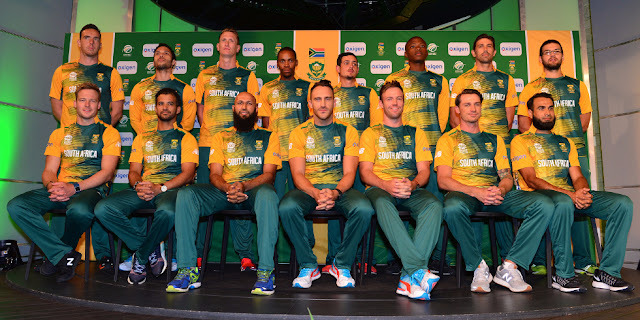 South Africa (RSA) Team Squad, Player List, Schedule For ICC Champions Trophy 2017 : One of the Top teams in the World cricket but yet named as chokers are the Proteas – South Africa. South Africa (RSA) who has a not good track record in the ICC tournaments, They have just succeeded once in 1998 knockout cup. Except 1998 performance, South Africa has failed to win any other tournament. Perpetually, the team has been exposed to pressure and intense situations and hence are known as chokers. The South African team is the only team in the world who consistently played 4 semifinal matches. South Africa, top contenders for 2017 Champions Trophy, have declared their final 15 man squad. As expected, RSA under the captaincy of Faf du Plessis will play for ICC Champions Trophy. Few names like Dwaine Pretorius & Andile Phehlukwayo are new to the squad but remaining squad remain the same which has been performing for past year. Return of Dale Steyn was the good news for South Africa team. Dale Steyn had suffered the injury earlier in 2017 due to he was out of the IPL. Now his name in top 15 means he will be fit till ICC Champions Trophy 2017. All Teams will play warm-up matches in England, But South Africa are scheduled to tour England for a ODI series that will be good to adapt the England conditions, So they are not scheduled for any further warm up matches. South Africa are scheduled to play 3 ODIs against England starting from 24th May 2017. South Africa is in Pool B along with three Asian teams – Pakistan, India and Sri Lanka. After the 3 match ODI series, South Africa will kick off their campaign against Sri Lanka on 3rd June. This will be followed by Pakistan and India on 7th and 11th June. SUPPORT-ALL THE LOGOS, CONTENTS, TRADEMARKS, IMAGES ETC ON THIS WEBSITE ARE NOT OUR INTELLECTUAL PROPERTY. ALL THE CONTENT DISPLAYED ON THIS WEBSITE IS THE COPYRIGHT OF THEIR RESPECTED OWNERS AND COLLECTED FROM ICC OFFICIAL WEBSITE FEW DIFFERENT SOURCES ON WEB.